I know…I had never heard of it either. 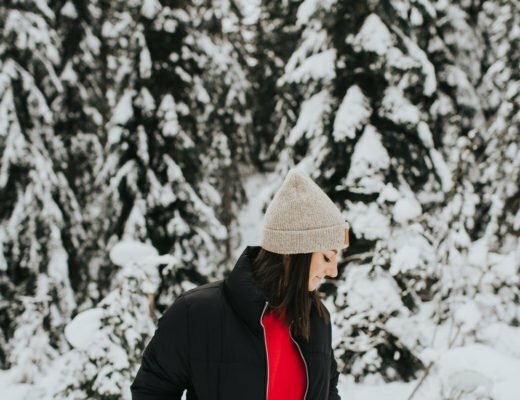 As a blogger, I feel like we’re caught in this weird place of wanting/needing to share great things that we find, but maybe part of what makes them great is that no one knows about them. And then we put them on our blogs and all of a sudden you can’t hike Rattlesnake Ridge unless you get there before 9am. 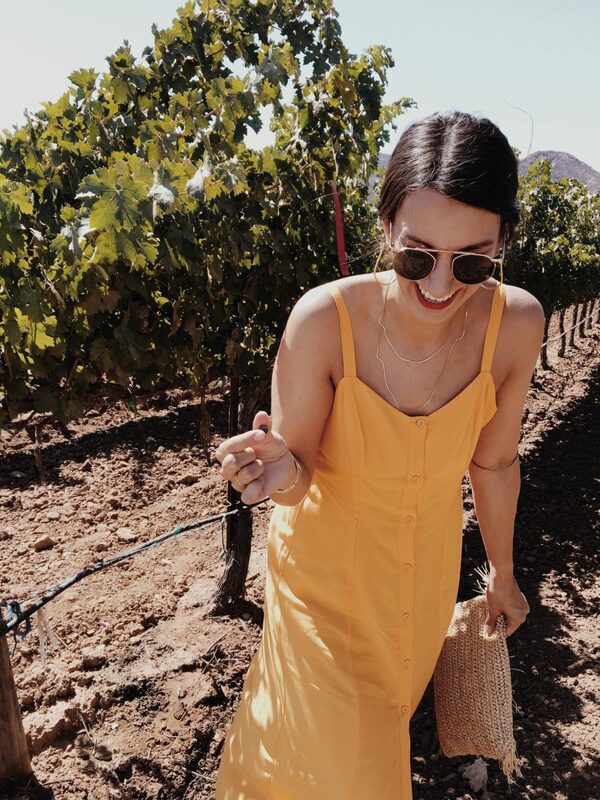 But I’m not the first one to talk bout Valle and the hidden gem that is their wine country. (I actually think Rihanna did it first). And I have a soft spot for Mexican culture, and these people deserve our business. 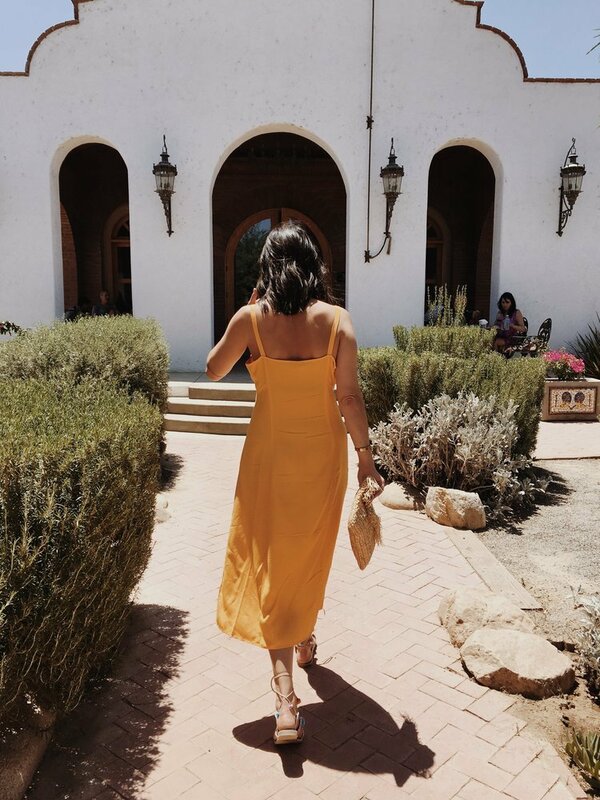 For my friend Neha’s bachelorette party in August we flew to San Diego and drove over the border into Mexico and continued on into Valle de Guadalupe wine country. (No, 15 girls did not drive themselves over the border, although I would, but more on that later). I might’ve fudged the details a little on how we were getting there when telling my parents about the trip. (Yes, I’m 30 years old. Yes, my mother still thinks I’m not going to make good decisions when left to my own devices). I had no idea what to expect, but I’m always down for a travel adventure and trying something new. We stayed in San Diego our first night at the Lafayette Hotel in North Park. Super cute place to stay, if you’re in the market. The next morning, much to our pleasant surprise, Dan with Boca Roja Wine Adventures was there in his 15 passenger van to pick us up, take us safely over the border, and basically be our keeper for the weekend. Everyone needs a Dan in Mexico. 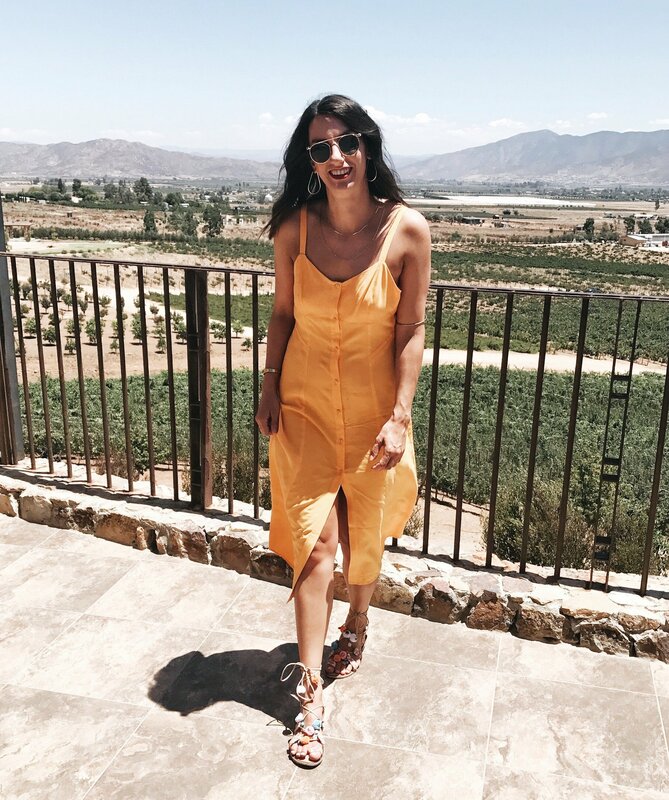 So, without boring you with all the details (I’m sure you can imagine what it looks like when 15 girls are in the Mexican desert for a bachelorette party), here are all the places we ate, drank and stayed, and I highly recommend you put them on your list. 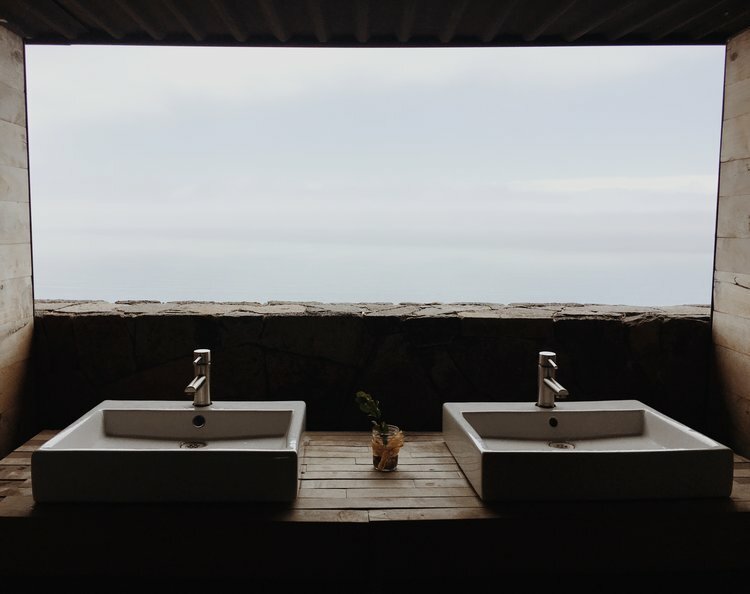 Cuatro Cautros (view from the bathroom sinks pictured above) – we stopped here on our way to the hotel for drinks and appetizers. 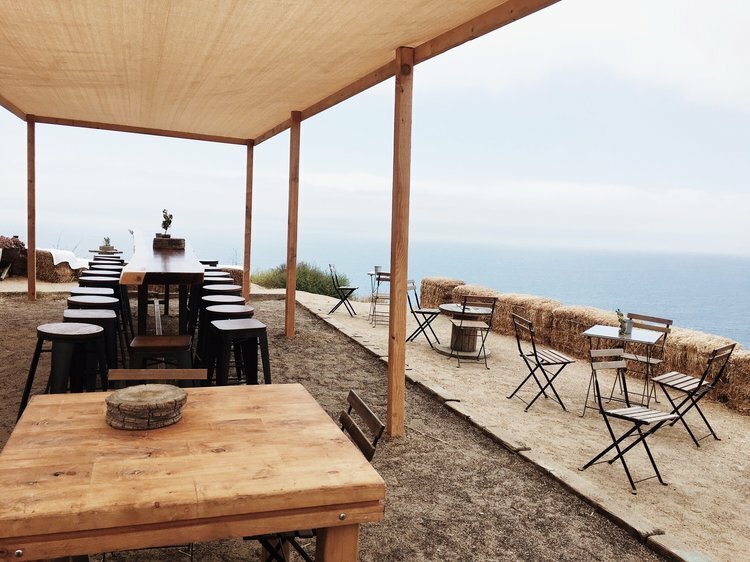 Very beautiful, minimalistic, modern decor (there are chairs and hay bales to sit on), with great wine, great bites to eat, and the best part is, you’re sitting on top of a cliff looking out over the ocean. You can also stay here. 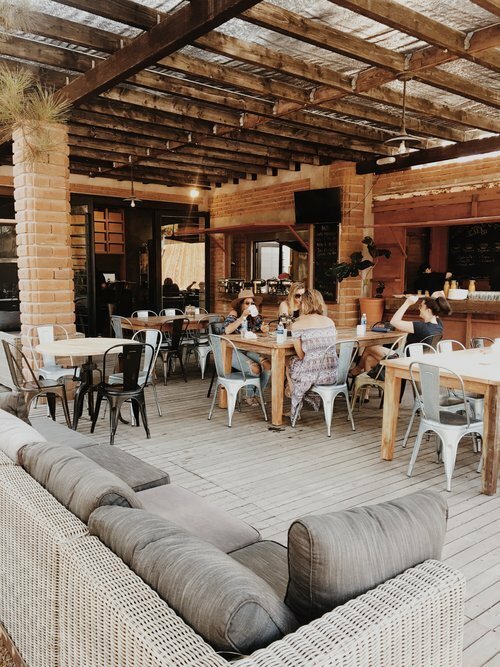 Laja – we had dinner here our first night, and it was nothing short of amazing. 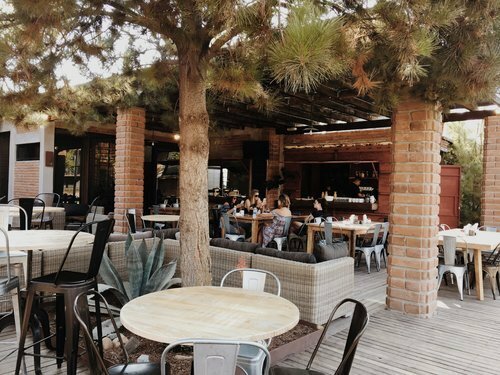 In what seemed like the middle of nowhere (but to be fair, everything feels like it’s on its own in the desert), everything is farm to table, mostly from their own garden, and the menu changes daily. I highly recommend doing the tasting menu. 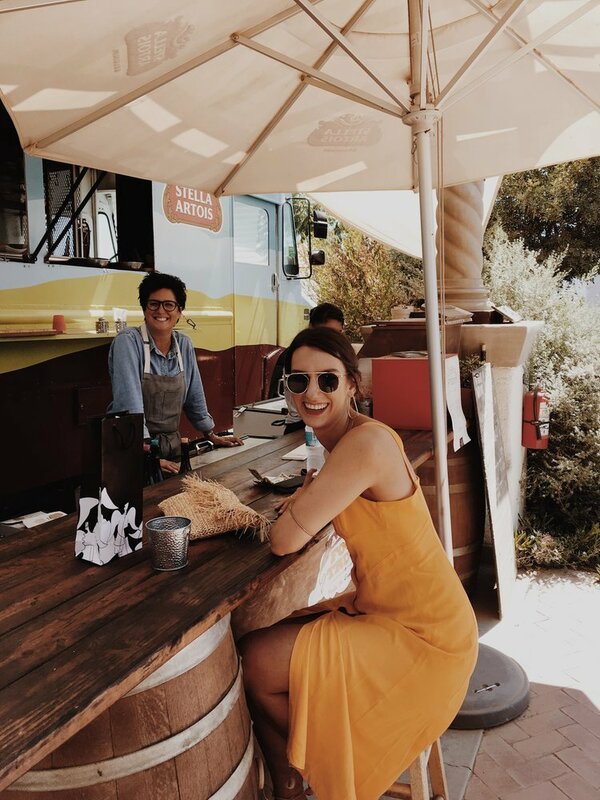 Adobe – food truck at the Adobe Guadalupe vineyard. We stopped here for lunch during our wine tour on Saturday and I recommend tasting their wine, as well as eating their food. They also have a little gift shop, where you can buy wine, trinkets, and the best olive oil I’ve ever had in my life. And the owner is adorable! 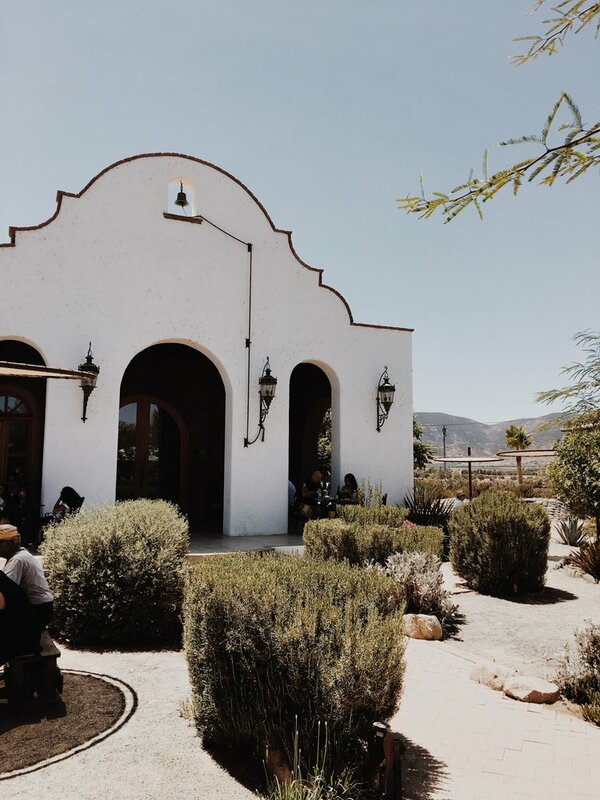 Finca Altozano – this was our last stop on wine tour day for dinner. Honestly, you could close your eyes and point at anything on the menu and not lose, but make sure you get the octopus! 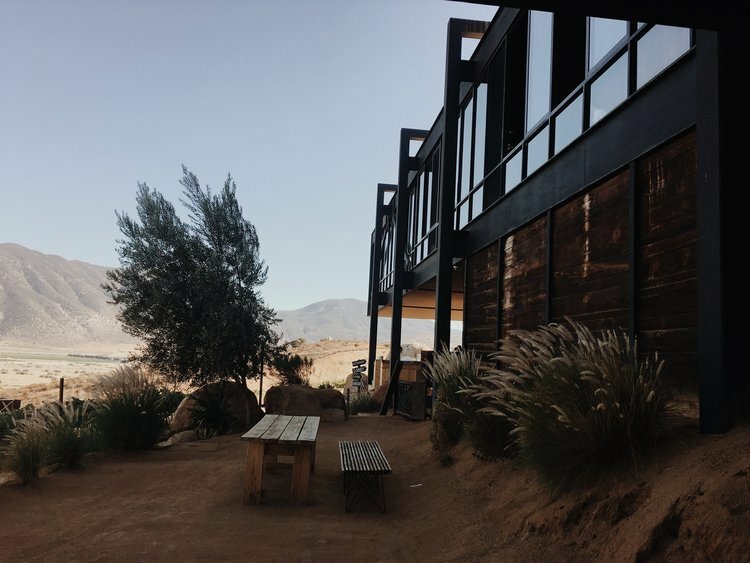 We stayed at Rancho L-86, a modern oasis in the middle of the desert. 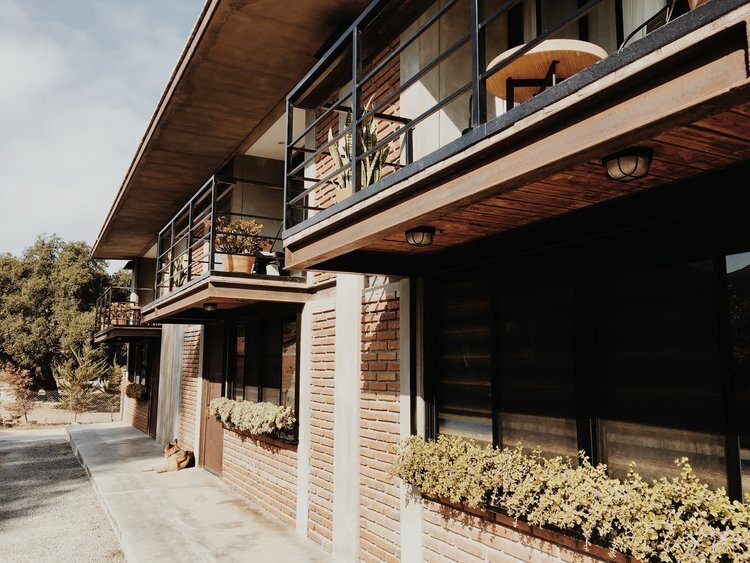 With lattes you’ll be craving from home and a chilaquiles buffet that I can’t stop talking about. 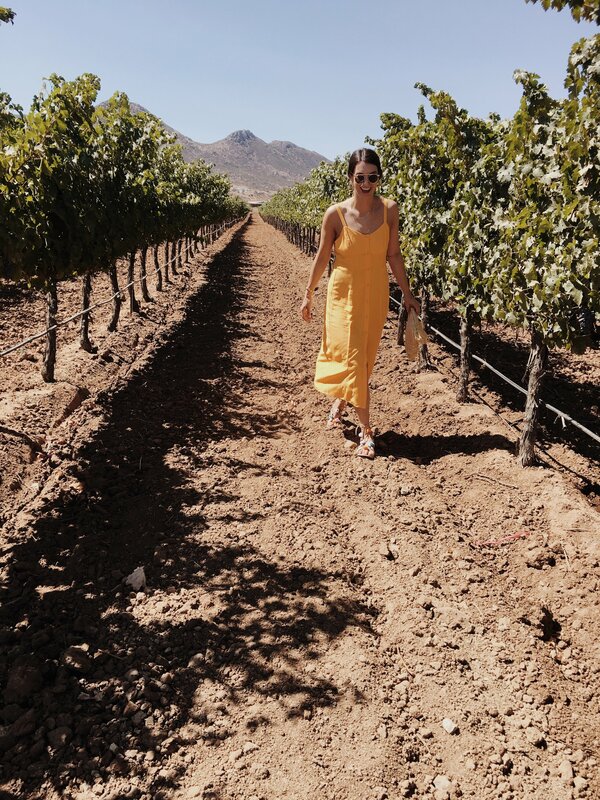 I would also love to stay at Encuentro Guadalupe – we did some wine tasting here and it’s maybe the most beautiful property we visited. 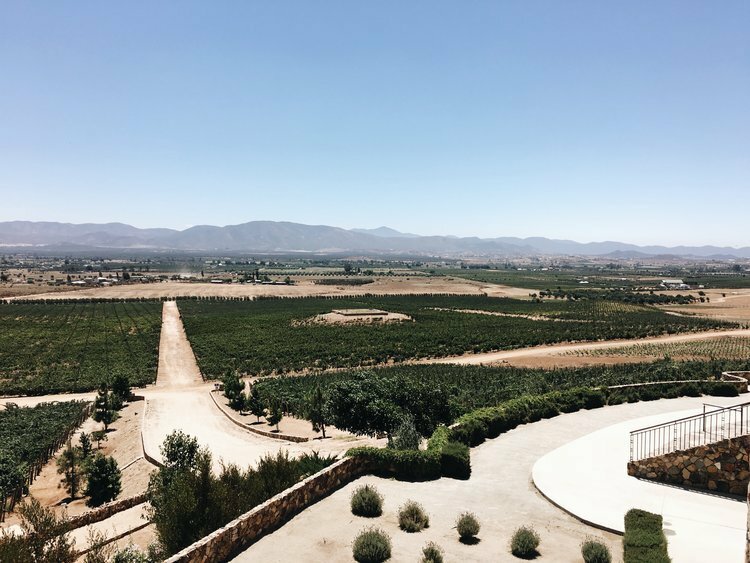 If you’re going down to Valle for the first time, I highly highly recommend Boca Roja Wine Adventures. They will pick you up in San Diego (maybe other places, but that’s where we were), and drive you down, take you to wherever you’re staying – you can also stay on their property – and then they know all the good places to wine taste and eat, and you don’t have to worry about where you’re going or how you’re going to drink too much wine and drive around. We really couldn’t have done it any other way. Dan was our guide, and he was wonderful. 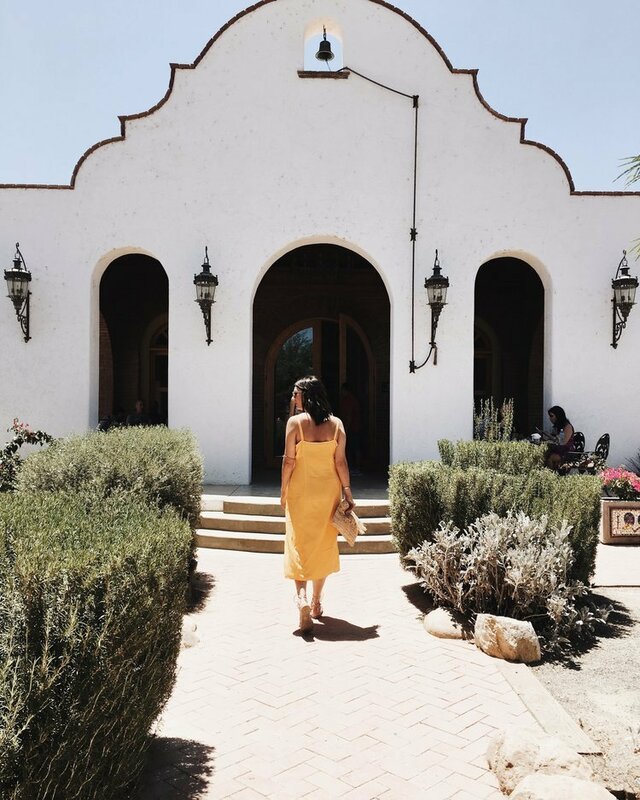 And let’s be honest, everyone needs a keeper when galavanting Mexican wine country. This sounds so cool! Question for you, I saw Boca Roja Wine Adventures does day trips. Did you book a private trip and have them set up the whole weekend or was it just a day w/ them and you planned the rest yourself? Also, how many nights did you spend in mexico/was it enough? I’m looking at doing a bachelorette there as well with the same idea: night in SD, then onto Valle for one or two nights. I’m honestly not sure about all the logistics! I went for a bachelorette party as well, and was kind of just along for the ride. We were “hosted” by them the whole time, so I believe they planned everything and took us to their highlights. 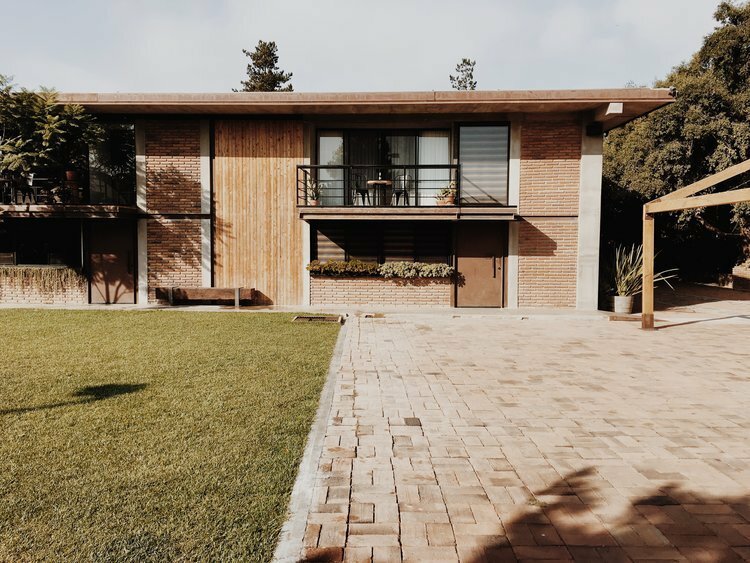 We were there for 2 nights – we stayed in SD for a night and then had 2 nights in Valle. It felt like enough! I would do 2 minimum, and if you wanted to stay longer, there’s still plenty to see/do.